Step 1) Heat 1 cup milk, 1 cup sugar, and 1 cup butter in a large pot (the pot will function as a mixing bowl, so use a big pot). Once butter is melted, remove saucepan from heat. Allow to cool to lukewarm. Step 2) After the milk mixture has cooled slightly, stir in yeast and beaten eggs. Slowly stir in 6 cups of flour. Dump the dough onto a floured counter top. 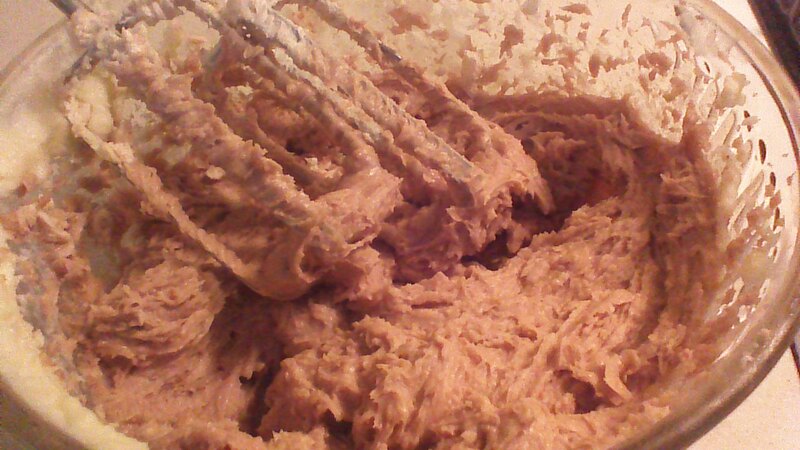 Step 3) Knead dough with your hands until the dough is nice and smooth, about 6 – 8 minutes. Add additional 1 cup or so of flour as needed to prevent sticking. Step 4) Place dough in a large, lightly oiled bowl. Cover with a slightly damp cloth (a clean kitchen towel works well) and set dough in a warm (not hot) place to rise for 1 hour. Step 5) After 1 hour, divide dough in half. On a lightly floured counter top, roll into two approximate rectangles, each approximately 2 feet long and 6 inches wide. Step 6) Blend together 12 ounces of cream cheese, 2 teaspoons vanilla extract, 1 cup of sugar, and 2 tablespoons cocoa powder. 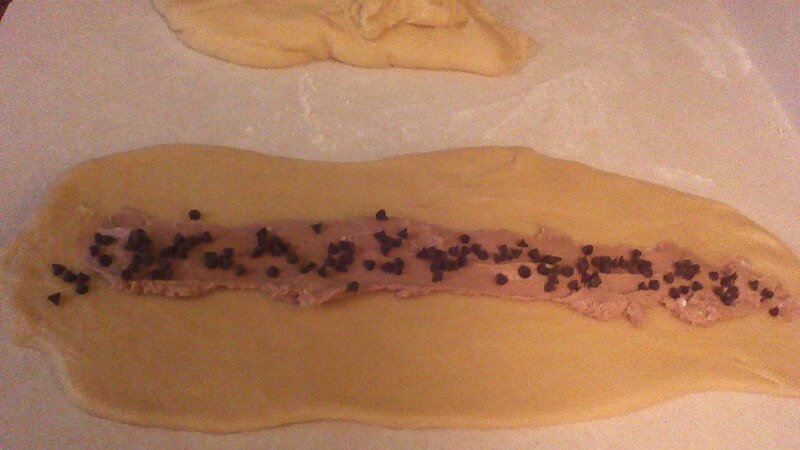 Spread this mixture down the centers of each rectangle, and sprinkle with 1/2 cup of mini chocolate chips. 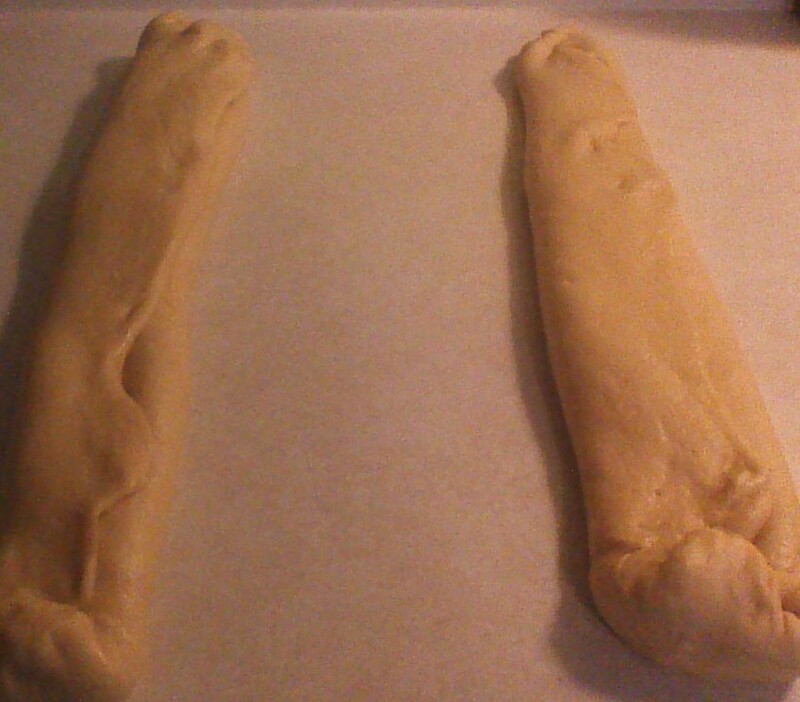 Fold the rectangles in thirds, to make long, skinny loaves with the filling trapped inside (see photo, above). Step 7) Carefully transfer each loaf to a separate, well greased baking sheet. Bake in a preheated 325 degree oven for 40 – 45 minutes or until the top is golden brown and sounds a bit hollow when tapped with your fingertip. Step 8) Remove Chocolate Cheesecake Loaves from oven and carefully transfer the loaves to a wire rack for cooling. Step 9) While your loaves cools, blend together 4 ounces of cream cheese, 2 cups powdered sugar, 1/2 teaspoon vanilla extract, 2 tablespoons cocoa powder, and milk to make frosting. Add the milk only 1 tablespoon at a time – you don’t want runny frosting! 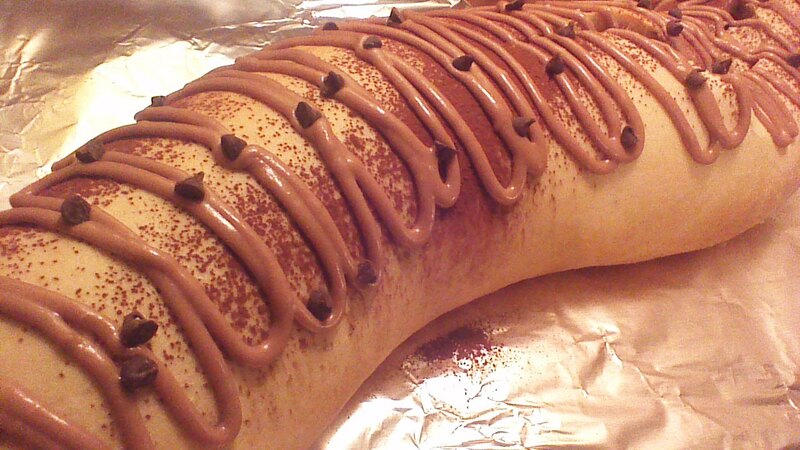 Step 10) When your Chocolate Cheesecake Loaves are completely cool, drizzle ribbons of frosting all over the top. 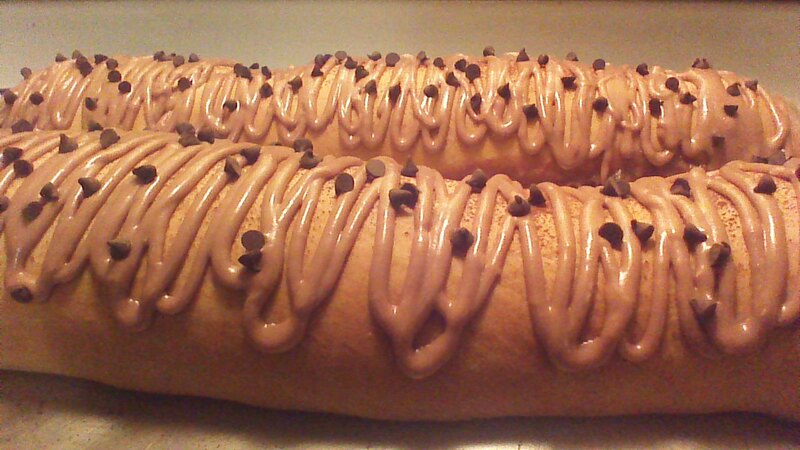 Sprinkle with mini chocolate chips. Enjoy! This entry was posted in baking, chocolate, dessert and tagged baking, bread, breakfast, children, Chocolate, Cooking, dessert, dinner, Family, Food, frugal, Homesteading. Bookmark the permalink.